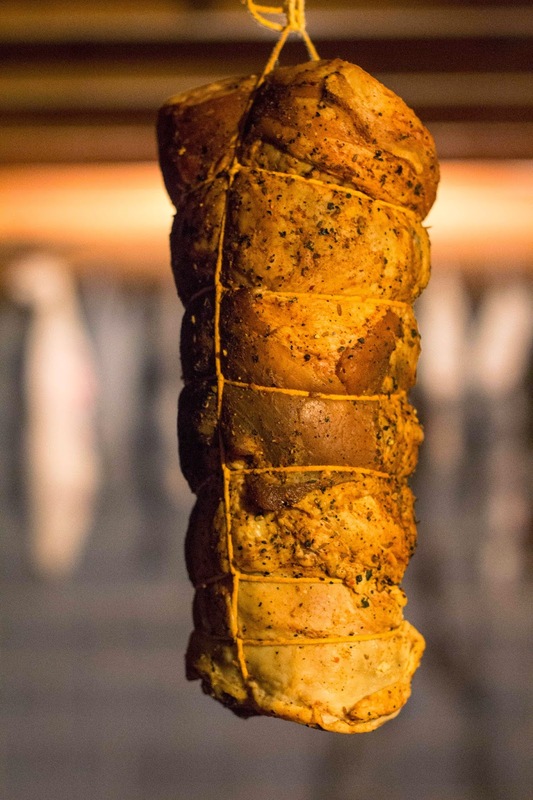 The last time I came across a breast of lamb I thought, "if this was cut just a little bit larger to include the belly, I could roll this into a decent-sized piece of pancetta." Well I finally got my chance! I briefly thought about a lamb bacon, but really liked the idea of a lamb pancetta. There are already a few "lamb bacons" on the market, made from cured and smoked lamb bellies (and a cool and very easy at-home lamb bacon recipe in Edward Lee's new cookbook, Smoke and Pickles). I like the lamb bacon I've tried, but I was excited to try a pancetta format 1.) because I've never had it before and 2.) I think lamb goes really well with garlicky, peppery flavors like pancetta. So I rolled out the belly and breast and cut out the small remaining ribs to make a flat rectangle of meat. Although ribs are not normally included in pork bacon, I wanted to get a sizable piece of meat with the lamb. This reminded me a lot of when I cured Mangalitsa pork ribs like bacon, so I didn't have many worries about curing lamb breast in the same way. Next it was time for figuring out a proper spice mix. Standing on a chair, I was fiddling through all the various spices in the top of my cupboard when I found my leftover merguez spice blend from lamb sausage. I opened the mason jar and smelled the cumin, chiles, fennel, cinnamon...oh yeah, this will be wonderful to cure the lamb with. 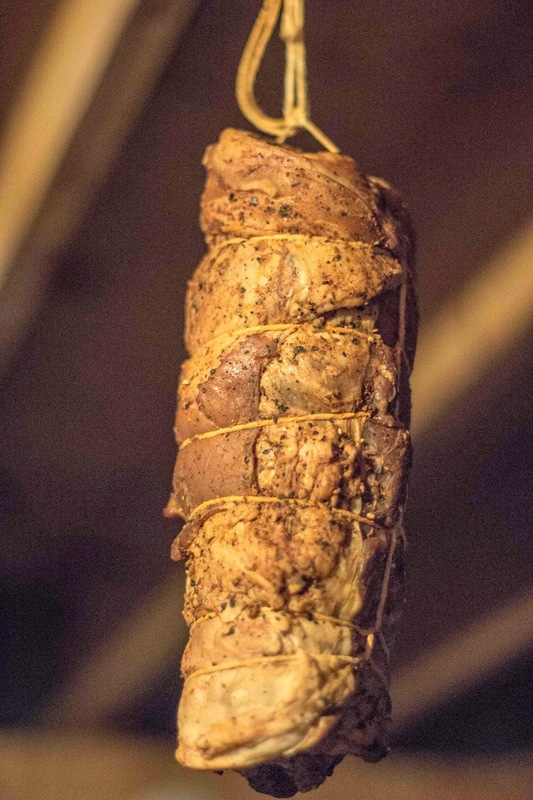 Granted, a North African spice rub made for a strong departure from my original idea of an Italian pancetta, but I was committed to the idea now. I rubbed the lamb with salt, sodium nitrite, and plenty of my merguez spice blend. I also added fresh garlic and more red chile flakes. 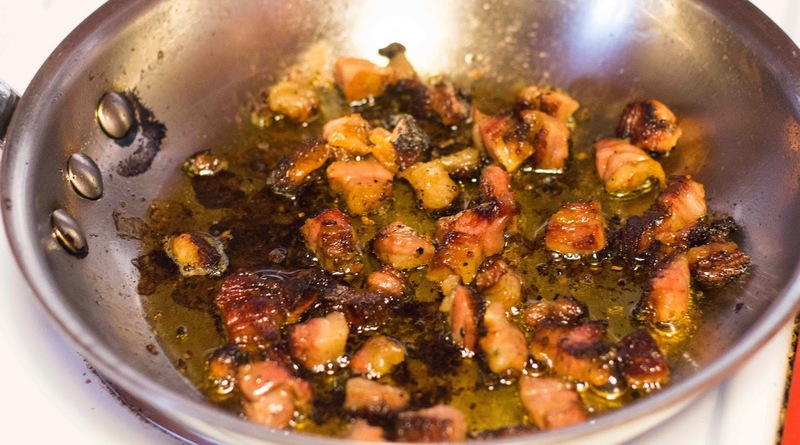 Since the finished pancetta would be used as a garnish, I wanted the flavors to be a little more intense than if this was used for an entree item like merguez sausage. After seasoning, I let the lamb cure for 5 days. After that I rolled it into a bundle and tied it tightly like a lamb belly roulade. I hung the belly to dry from the basement rafters at about 50 F for just shy of two days, then cut it down. Slicing the belly into cubes, it looked beautiful. Cooked up in a pan, the lamb fat rendered out nicely, turning the lamb pancetta into crisp little cubes of spicy belly. 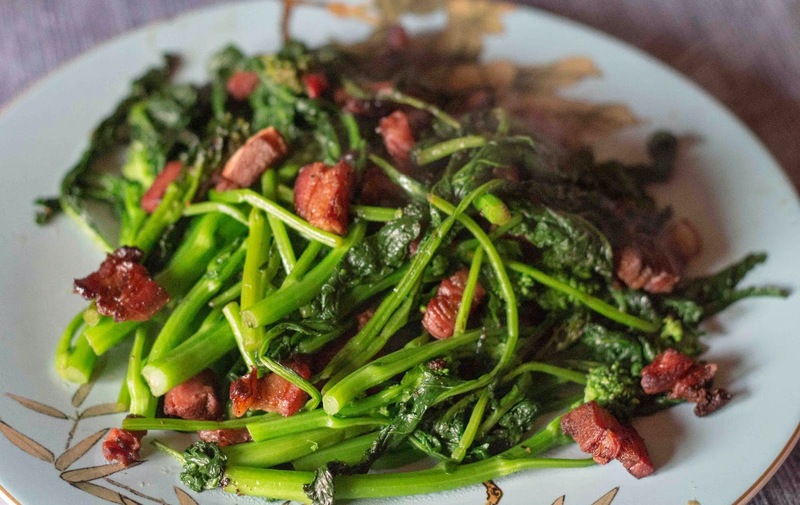 I used the lamb pancetta to garnish a plate of blanched broccoli rabe. The earthy, slightly bitter broccoli rabe was tempered by the rich, fatty bite of the lamb. The warm spices and hot chiles gently fading away after each forkful. As a first try, I'm really pleased with this product. I think it'll also be great with grilled eggplant or sauteed kale - strong vegetables that can match the flavor of the lamb.